"Bernd literally did not know fear and sometimes that is not good." "The risks he takes, sometimes bordering on the reckless, are unbelievable." "Rosemeyer never took any foolish risks. It was just that he drove faster than other people could." 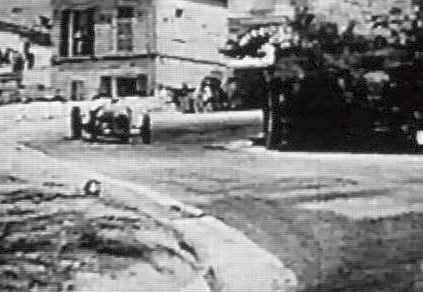 On a short film sequence from the 1937 Coppa Acerbo, raced through the villages along the twisty Pescara circuit, one can see two Italian carabinieri looking at a Mercedes-Benz W125, the most powerful GP car of the pre-war era, going through a right-hand curve before coming out upon a short and narrow straight. 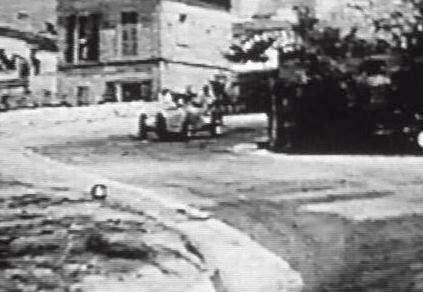 Then, moments later, another car appears right behind the Mercedes, an Auto Union C type coming through the corner at seemingly a much higher speed. The Mercedes is caught up with just as it reaches the short straight. There, just as the cars are seemingly about to touch, the Auto Union driver acts without a moment's hesitation, the car shaking as it is suddenly forced out to the left. 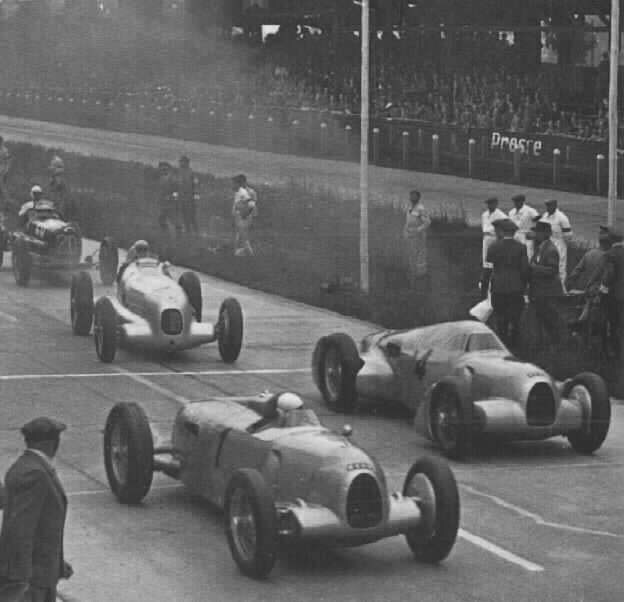 The next second the Auto Union goes up side by side with the Mercedes and, entering the next left-hander, the cars disappear in a cloud of dust with the Auto Union in front. The carabinieri are looking at each other, gesticulating with their hands and laughing. You can see the amazement and excitement in their eyes. The only car Bernd Rosemeyer ever raced was the tricky rear-engined Auto Union, yet in his short career he established himself as the world's greatest natural racing talent ever. Sometimes truth surpasses fiction. If someone would ever dare make a cinema movie about Bernd Rosemeyer's life, I guess most of the audience would say, "Come on! Only Hollywood would create such a story. That is not even remotely realistic." I guess there are more anecdotes about Rosemeyer than of all the other pre-war drivers put together. It is hard to separate fact from fiction but but I'll do my best here. Bernard Rosemeyer was born on October 14, 1909 in Lingen (Ems), a town near the Dutch border, with some 50,000 inhabitants. His father owned a garage and repair shop, Rosemeyer & Co, at Bahnhofstraße and it was there where Bernd's interest for motorcycles and cars started. After finishing school Bernd, together with his one year older brother Job, became assistants in the repair shop. Known to his friends as Spotte (the sprat), cars and motorcycles soon became young Bernd Rosemeyer's sole interest. There are stories about how he at the age of 11 took some friends for a ride in his dad's car to the neigbouring town of Nordhorn, ending up at the police station. And that the following year, together with his brother, he had organized a little motorcycle race of their own. It goes without saying that Bernd won, because he turned out to be a natural talent with perfect balance regardless of whether he raced it sitting, standing up, laying down steering with the feet or sitting backwards. At the age of 16 he received driver licences classes I, II and IIIB only to lose them soon afterwards after doing some "stunt drives" in the streets with his motorcycle. For Bernd Rosemeyer the breakthrough came in May 1931 when the Zündapp team searched for a replacement for their ill speedway driver. Bernd was selected and after having done some test drives on the Lingen hippodrome, he was entered in the 250cc class for the Oldenburg grasstrack race on May 31st. Rosemeyer won first time out, his first of 11 grasstrack victories that year. Next year he turned to road racing, driving BMWs as a privateer, while his brother Job worked as his manager, handling the contracts and the money, as Bernd seems to have been totally ignorant of such matters. That year Bernd dominated the Hohensyburg 500cc race and finshed second in the 1000cc class. In 1933 he was picked up by the NSU team, becoming victorious at the Schleizer Dreieck Rennen and the Bodhenheim Ring Rennen. And in Hungary he won the Guggerberg Rennen, the Tat kilometre race, the Gödöllö Bergrennen and the kilometer race in Budapest. In 1934 Rosemeyer signed for the DKW motorcycle team, DKW being one of the companies in the newly formed Auto Union. His successes included victories in the Marienberger Dreieck Rennen, Schleizer Dreieck Rennen, Gold medal in Hohenstaufen, Gold medal in the 3-Tage Harzfahrt, Gold medal in the 2000 km Fahrt and Gold medal in the Internationalen 6-Tage Fahrt. The Auto Union team was searching for new drivers for their rear-engined GP cars for the 1935 season and Rosemeyer, together with 11 other drivers, was invited to a test at the Nürburgring on October 24-25. According to Neubauer, Rosemeyer arrived late to the test, wearing a suit and not carrying any racing gear. He then stepped into the car and did the Nordschleife at a time of 11'20". Ludwig Sebastian mentions the same time in his book. However, the Auto Union test report says that Rosemeyer's best time was 12' flat, 45s slower than GP veteran Paul Pietsch. At the Südschleife test, where the track was unknown to all participants, Rosemeyer's time was just 1.6s slower than Pietsch's. One thing is certain: Rosemeyer's driving gave team manager Willy Walb, who had placed himself in the Mühlenbach corner to have a look at the new drivers' performace, quite a scare. Rosemeyer entered the corner at full speed and duly spun, causing Walb to jump into the ditch for shelter. Even if Rosemeyer was now handling ten times the horsepower he was used to, he was a fast learner and next time around he took the corner perfectly. Walb signalled Rosemeyer to come in but the latter ignored the signs and continued until he went out of fuel. In his report Walb used words like "impudent superiority" for Rosemeyer's driving style but he still saw the potential and recommended him, together with Paul Pietsch, as junior driver for the 1935 season. Note that he was selected over Simons, who had the right connections and had done a lap that was 14s faster. The following year Josef Goebbels asked new team manager Dr Feuereissen to give Simons another chance - once again he failed to make the team. With a contract in his pocket Rosemeyer took on GP racing with child-like enthusiasm. He more or less lived at the factory, going around asking everyone questions about everything. Finally, engine mechanic Ludwig Sebastian got enough and said: "Listen mister! If you want details about the engine performance you'd better go to the office and ask. I'm not allowed to tell such things, not even to you!" At Walb's office Rosemeyer became a nuisance until Walb finally gave in and promised him a ride in the preliminary European race of the season, the AVUS-Rennen in Berlin. On May 26, 1935 a notably nervous Rosemeyer made his car-racing debut (see picture above). He had qualified fourth fastest in an Auto Union streamliner with a covered cockpit, which gave him a front-row position for the first heat. After a slow start, Rosemeyer was immediately passed by Fagioli's Mercedes. Once up to speed Rosemeyer repassed, held his position for a lap, went up too far in the Nordkurve banking, was repassed by Fagioli again and then suddenly had a high-speed puncture. He managed to control the car and bring it to a halt. Rosemeyer's first race had lasted only three laps but in that short time he had had the chance to experience most of the events that belong to a GP race and he had survived without making any foolish mistakes. Time to make use of of the lessions learnt. The next race was the Eifelrennen on the Nürburgring. Starting from a midfield position Rosemeyer gained positions as others hit trouble, and with three laps to go Rosemeyer passed Caracciola for the lead. The sensation was there, a totally unknown Auto Union junior driver was leading the race! For two laps Caracciola followed the Auto Union closely, unable to pass, regardless of Mercedes team manager Neubauer's nervous signalling in the pits. Rosemeyer's windscreen had been broken by a stone and the car was running on 14 cylinders but that did not hinder the young driver from racing flat out. On the last lap, coming out of Schwalbenschwanz, Rosemeyer changed gear too early and Caracciola was able to out-accelerate the Auto Union and take the flag 1.9 seconds in front of Rosemeyer. Cruising back to the pits a devastated Rosemeyer was driving with one hand while wildly banging the car with the other. But with this drive Rosemeyer had secured himself a place in the team as a full-time driver. The German spectators had found themselves a new hero. Auto Union was upgrading the engines to 5.6 litres at that time and experienced lots of trouble, especially with the carburettors and ignition. Rosemeyer retired from the French GP but later took over Varzi's abandoned car to finish 5th after being in and out of the pits several times showing his would to race flat-out to the flag regardless of circumstance. Back at the Nürburgring for the German GP Rosemeyer was clearly driving with his heart rather than his brain. Rosemeyer was in top form, throwing his Auto Union through the curves in impossible angles, to the joy of the spectators, but on lap 6 Rosemeyer's hard driving took its toll as he came into the pits with his tyres in shreds after having left the track. He was able to catch the field again but then fell back with technical problems to finish fourth in a classic race won by Nuvolari. With no Mercedes team entered for the Coppa Acerbo Rosemeyer and Varzi came to Pescara as favourites. Bernd drew a bad starting position on the last row but soon forced himself up into second place. But then, in a duel with Nuvolari, he skidded off and burst both rear tyres. Back after a pit stop Rosemeyer charged on, locked his brakes and ran off the track again. This time the car flew over a ditch and continued with high speed through the hole between a telegraph pole and the parapet of a bridge before re-entering the track. The rear body was badly bent but Rosemeyer continued to finish second behind Varzi. Later Dr. Porsche measured the gap between the pole and the bridge but no book seems to agree on the results. Some say that the gap was 2 cm wider than the Auto Union, others 5 cm. Some even claim it was 6 cm narrower! Anyway, it had been a close call. On a rainy Bremgarten circuit where Caracciola dominated the race, Rosemeyer finished third in the Swiss GP. In the Italian GP Rosemeyer had to abandon his own Auto Union on lap 19 with transmission failure and he took over Pietsch's car to finish third. He finished a lowly 5th in Spain after a stone had smashed the windscreen and forced him to make a pit stop. Then, in the final race of the year, the Czech GP at Brno, everything finally came together for Bernd - he dominated the event to take his first GP victory in formidable style. In more than one sense it was to be an eventful day for Rosemeyer - at the victory ceremony he was introduced to a popular German heroine, Fräulein Elly Beinhorn, the famous international flyer. She had in fact come to the see the race in hope for a Stuck victory and was less thrilled by the meeting than Bernd. The latter showed that his fast decision making wasn't restricted to racing. After some 15 seconds he had made up his mind that this was the girl he would marry. So he asked whether, back in Berlin, he could get a photo of her (please! please! ), in a way to secure that they would meet again. Elly admitted in her biography that she was amazed by a driver who at the post-race party celebrated his first victory with a glass of lemon juice, then said goodbye and went to bed at 11pm. Nowadays we expect such professionalism from F1 drivers, but back in 1935 this must hardly have fitted the public opinion of racing drivers' behaviour. As usual, once Bernd had made a decision he went for it with full determination. Elly had hardly returned to Berlin before Bernd was at her door to pick up the photo. An angry Elly told him she was no movie star and she wasn't managing any kindergarten either. (Bernd was 2.5 years younger than her.) But Bernd did not give up and finally she had to give in to his spontaneous charm. In fact Bernd and Elly seemed to be made for each other. Both lived life the full 100% and both were confirmed fatalists. Their lucky number was a fate-tempting 13. Bernd and Elly became enormously popular thoughout Germany and they could not avoid having their fame manipulated by the regime. Rosemeyer was handpicked by Heinrich Himmler to become the archetype aryan hero and was made a member of SS. However, to draw any conclusions about Rosemeyer's political ideas from that would be totally meaningless. I hardly think there is anyone thinking that Schumi spends all his spare-time chewing Tic Tac and smoking Marlboro, regardless of what it says on his overalls. Just before Christmas there was an incident that could have had serious consequences. After eating a bad oyster Rosemeyer got hospitalized for six weeks with jaundice and liver problems, missing the pre-season tests at Monza. He was however fit enough for the final tests in March and was able to take part in the season-opening event at Monaco, raced under horrible rainy conditions. After only 6 laps Rosemeyer had to do a pit stop to adjust the throttle cable. Trying to make up for the lost time he slid on an oil strain, came sideways up the hill towards Hotel de Paris, hit a stone wall and was out of the race. He returned to the pits with an ornamental stone vase, loosened from the wall by the crash, as a "trophy" in his hands. The trip to Africa for the Tripoli and Tunis GPs in May proved to be a disappointment as Rosemeyer's car caught fire in both events. During practice for the Penya Rhin Rosemeyer crashed when the steering failed, wounding his nose and knee. Then at the race he lost five laps because of a loose spare fuel tank and finally finished 5th. After four disappointing races Rosemeyer was finally able to score, doing the race of his life at the Eifelrennen. In terrible conditions with heavy rain and thick fog, in which the sight was sometimes reduced to 20-40 meters, Rosemeyer was in a class of his own, With his extraordinary ability to see through the fog the Auto Union driver opened up the gap to drivers like Nuvolari by 30 seconds a lap and went on to take a remarkable victory. After the race Rosemeyer became known as the Nebelmeister (fog master). Nuvolari got his revenge in Budapest, where the twisty track fitted the Alfa Romeo perfectly. For 35 laps Rosemeyer fought to get the big Auto Union through the corners. His hands were bleeding and he had to throw the glowes away. Finally he had to give up and let the flying Mantuan past. After the race Rosemeyer was unable to use his hands and had to be lifted out from his car by the mechanics. On July 5 Rosemeyer made a guest appearence at the motorcycle GP at Hohenstein and then a week later on July 13 he got married to Elly. 13 days after the wedding Rosemeyer took a superb victory at the German GP, finishing 4 minutes in front of team mate Stuck. At the Coppa Ciano, however, Rosemeyer drew an uninspired race and gave up after only 6 laps. 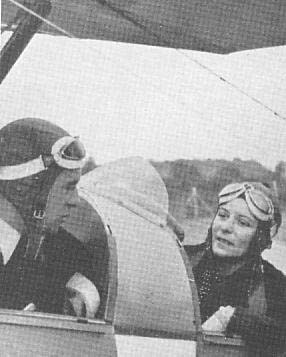 On the same day his new wife was out flying over three continents in one day with her Messerschmitt and Rosemeyer admitted that he was so nervous that he could not concentrate on the race. Afterwards Rosemeyer sent a telegram to his wife: "Congratulations, but you must never leave me again." In her biography Elly says that the decision was easy, as obviously Bernd was a greater talent as a driver than she was as a flyer. From then on, with Elly accompanying him to the races, nothing could go wrong for Bernd: victory at Coppa Acerbo, victory at the Swiss GP, victory at the Großer Bergpreis von Deutschland mountain climb, victory at the Italian GP, victory at the Feldbergrennen mountain climb. Bernd Rosemeyer became the European Champion and German Mountain climb champion of 1936. At the Swiss GP he had a fierce fight with Caracciola including fistshaking and blue flags as Caracciola tried to block Rosemeyer's attempt to pass. The duel continued after the race in the form of a - in their wives' opinion - highly embarrassing verbal fight in the hotel elevator. On the other hand, Rosemeyer and Nuvolari became good friends at the same event as Bernd while lapping lost his brakes and made a risky manoeuvre to keep clean of Nuvolari, disregarding the fact that it could possibly cost him victory. There was also trouble at the Feldbergrennen where Rosemeyer had promised von Delius not to race flat-out to make von Delius' times look a bit more competitive with regards to the upcoming 1937 driver contract negotiations. After the race Rosemeyer noticed that von Delius' times up to the point the latter retired had in fact been better than Rosemeyer's. It took some effort on von Delius' part to convince Bernd that his intentions with the agreement had not been to try to steal victory from him. For marketing reasons Auto Union decided to send two cars to the South African GP and the Grosvenor GP handicap races in January 1937. Bernd and Elly decided to turn the trip into their honeymoon and spent 8 days crossing Africa in their Messerschmitt Taifun, Elly the head pilot and Bernd the co-pilot and - as he proved to be - an excellent mechanic. It turned out that the handicap rules were such that the Auto Union cars had to race against almost impossible odds but Rosemeyer finished 5th and 2nd after some very hard driving. Preparing to return to Europe with their plane, Bernd received the news that his mother suddenly had died. The emotional Rosemeyer decided to skip the Monza tests, going for a ski holiday in the Dolomites instead. There he received more bad news. His brother Job had crashed against a tree, receiving fatal injuries. There was hardly any time for grief as these were busy days for the Rosemeyers, who moved into a bigger flat. Until now they had lived in Elly's small apartment with Bernd sleeping in a bed sofa. At the same time Bernd, who had decided to become a pilot and as usual took on the challenge with 100% enthusiasm, was working on his flying license. There were also tests at Monza in early April and at the new rebuilt AVUS in mid April he had to attend. 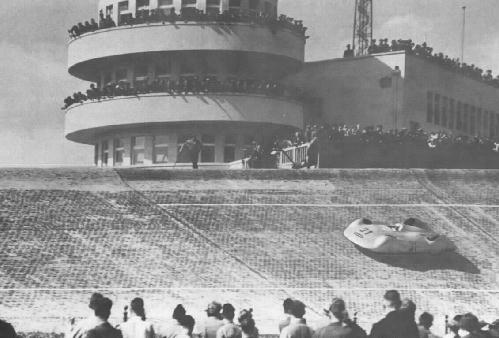 At AVUS there was an incident where Rosemeyer's Auto Union streamliner went up too high into the newly built steep Nordkurve. The car was carried up to the edge of the wall and for seconds the right wheels scraped the upper wall border. The car swerved but Rosemeyer saved the situation and possibly his life as well. For the team the 1937 season proper started at Tripoli on May 9. It was a confusing race with a multitude of tyre changes (Auto Union mechanics changed 35 tyres during the race) and at the end Rosemeyer, who had had a fair share of pit stops, unlapped himself and almost managed to surprise Lang, who was cruising in the lead with his Mercedes-Benz, totally unaware of the challenge, as there had been errors in the Mercedes team's lap tables. Rosemeyer finished second, 10 seconds behind the winner. The next event was the famous Formula Libre race at the rebuilt AVUS track. During the first heat Rosemeyer's streamliner was running on only 13 cylinders and the driver's goggles were almost unusable due to oil. Even then he finished just 0.7 s behind the winning Caracciola, Bernd making the last lap in an incredible 4'11"2. With 276.39 km/h (171.78 mph) that is the fastest lap ever done in a formula race. It would take 34 years before such speeds were seen at the Indy 500. In the final Rosemeyer had more problems finishing fourth after a stop for tyres. Totally oiled up from the broken engine Rosemeyer had to be lifted out of his car. Right away Elly washed his overalls and shirt in gasoline to make Bernd look halfway decent. At the Eifelrennen Rosemeyer took his third consecutive Nürburgring victory after a fierce duel with Caracciola. After all, it was the 13th of June! After the Eifelrennen, as a further demonstration by Auto Union, the engine of Rosemeyer's winning car was removed and sealed to be used without service for the record attempts at the Frankfurt-Darmstadt highway three days later. On that day Rosemeyer set one world record and 6 new class records. On June 22 Bernd and Elly, and parts of the Auto Union team, boarded SS Bremen in Bremerhaven for a trip to New York and the George Vanderbilt Cup race. Rosemeyer definitely did not like the "Mickey Mouse" type of track with its wooden fence making it "impossible to see the curve in advance and act accordingly". After the first practice he needed a coupe of cognacs to recover from his surprise! In the race Rosemeyer was challenged by British driver Seaman in the new "suction carburettor" Mercedes. Near the end Seaman was rapidly closing in on Rosemeyer, but then Seaman had to make an unscheduled stop for fuel, leaving Rosemeyer to win by 50 seconds. "I really pushed my car through the corners in order to gain time and this was very tiring. I do not remember any other race which tired me so much", Rosemeyer said afterwards. After having been promoted to SS-Obersturmführer (First-Lieutenant) by Himmler for his victory at the 1936 Eifelrennen, Rosemeyer was now promoted to SS-Hauptsturmführer (Captain). Having returned to Europe with SS Europa, Rosemeyer arrived at the German GP in great form, being 11 seconds faster than his previous record during practice. In the race, on lap 3, the right rear wheel's hub cap disintegrated, dropping Rosemeyer back to 10th. He fought back to finish third in a tragic race in which Rosemeyer's best friend Ernst von Delius tangled with Seaman, resulting in injuries that proved fatal the day after. Bernd flew the Taifun himself to Cannes for the Monaco GP. However, a Monaco victory was something Rosemeyer was never able to achieve. 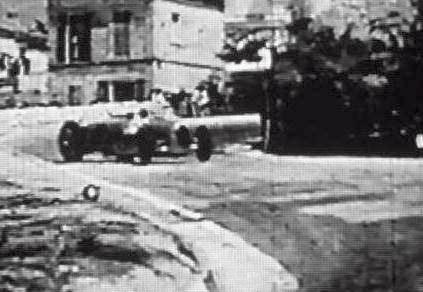 On lap 19 he sent his Auto Union into the sandbags at the Gasometre, destroying the steering. He then took over Stuck's car to finish fourth. The 1937 Coppa Acerbo is the race famous for Rosemeyer's feat to win the race despite losing a wheel. 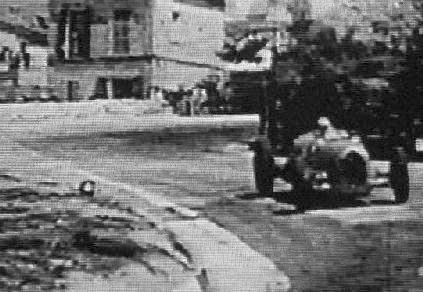 On lap 8 Rosemeyer struck the 10km marker stone with his right rear wheel. Three kilometres later the wheel departed from the car and rolled into the reserve tyre depot, stopping at the feet of the amazed pit crew. Rosemeyer's Auto Union arrived at the depot moments later, running on the brake drum! At the Swiss GP Rosemeyer made an early mistake in the rain and ran off the track. He was pushed back but was later disqualified for outside assistance. He later took over the car of his new team mate Nuvolari and recorded fastest lap in his chase for the leaders, but he was too far behind to be able to do anything, finishing fifth. While flying to Italy for the Italian GP at Livorno Rosemeyer got a serious cold and with an aching throat he was unable to challenge the Mercedes cars for the victory, finishing third. At the Czech GP Rosemeyer held the lead but on the ninth lap he locked his brakes and crashed. After taking over Müller's fourth-placed car Rosemeyer immediately put in some amazing laps on the 30km track, chasing the leading Mercedes trio. Rosemeyer had closed the gap to Seaman in third place to 48 seconds as the last lap started. Incredibly, Rosemeyer passed the surprised Seaman and was within 5 seconds of von Brauchitsch in second position when the race ended. The 1937 Donington GP proved to be Rosemeyer's 13th start of the year and he took a great victory in front of the amazed British crowd. With the GP season over Auto Union turned to speed record attempts. During the Rekordwoche in October Rosemeyer made a multitude of fast runs ending up with a total of 3 world records and 16 class records. Rosemeyer found that the speed attempts needed extremely hard concentration and nerves, comparing them to a full GP race. Once he collapsed and had to be pulled out of the cockpit. In November 1937 Bernd Jr. was born and there was a short break when Bernd spent time with his family. After hearing Mercedes was planning to have a go at the speed records Auto Union asked to be allowed to defend them. Eberan-Eberhorst designed a totally new, revolutionary bodywork, completed with panels that came close to the ground and channeled the air creating a vacuum, In the morning of January 28, 1938 Caracciola took the B class speed records for 1 km and 1 mile flying start on a closed section of the Frankfurt-Darmstadt highway. After that it was Rosemeyer's turn to have a try. After some hesitation because of the wind and a test run he started his record attempt at 10.40am. Having passed the first kilometre point the car continued on the flying mile but suddenly verged out onto the grass, went sideways, rolled and disintegrated. Rosemeyer was hurled out. His heart was still beating when the team doctor found him in the woods, leaning against a tree, but it stopped soon afterwards. Bernd Rosemeyer was buried with full military honours at Berlin Dahlem. Near the Frankfurt-Darmstadt autobahn, in the woods just beyond the Langen-Morfelden crossing, stands a pillar as a monument of the fateful event that took place here a long time ago. In sheer natural speed and car control - here's a picture sequence to prove it: one, two, three, four - and despite of drivers like Gilles Villeneuve, Ronnie Peterson, Jochen Rindt and Stefan Bellof, Bernd Rosemeyer was probably the greatest natural talent ever. He knew just one way to drive a race car - and that was flat-out. Rosemeyer's lack of experience with other race cars proved a positive asset and he hurled the big Auto Union about like a motorcycle, broadsliding around corners absolutely at the limit. No one has really been able to fully copy Rosemeyer's driving style since. Of course the B and C type Auto Union was a car extremely hard to drive flat-out. But from that it is wrong to come to the conclusion that the Auto Union was a bad racing car. Auto Union had the luck to find the right man in Bernd Rosemeyer. The car fitted his driving style perfectly and the combination proved to be a winner. (Remember that there are cars that seem to be perfect for some drivers while impossible for any other, such as Prost's understeering McLaren MP4/2C and Schumacher's nervous Benetton B194.) But one can only wonder what Rosemeyer would have done in a more conventional racing car. In an unofficial test drive for Mercedes-Benz Rosemeyer was very enthusiastic about how good the Mercedes' roadholding was. The statistics shows that Bernd Rosemeyer participated in 31 races which can be considered to have GP status. In them he started from the front row 20 times (remember that in those days the grid was decided by ballot in some of the races), took 10 victories and made 12 fastest laps. It is a stunning record, especially considering that Rosemeyer had never done any kind of car racing before joining Auto Union. Admittedly he made several mistakes that possibly cost him a victory or two. He ran off twice at Coppa Acerbo 1935 and crashed at the 1937 Czech GP. He made a mistake in the rain in Monaco in 1936 and also on the first lap of the 1937 Swiss GP. Reading the accounts of the races it is also notable that Rosemeyer was a heavy tyre user, often coming in early in the race with his tyres in shreds. On the infamous Nürburgring track, the ultimate challenge for any driver, Rosemeyer's abilities came to their own. His finishing record: 2nd, 4th, 1st, 1st, 1st and 3rd is impressive, but without some some mistakes and bad luck they could have been even better. Looking at his results one can also see that Rosemeyer had 4 victories in a car numbered 4 and one in car #8 (= 2 x 4). So one can say that 4 was Rosemeyer's lucky number as well as 13. Looking at the man himself it is notable that Rosemeyer lived for racing. Like a big child he showed immense enthusiasm for anything he participated in and was good natured, only to become very upset if he thought someone was trying to doublecross him. He was something of a rebel, of course, challenging the fate by taking 13 as his lucky number and finding great joy in running through town standing up on his motorcycle, kissing in public against Nazi orders, taking a smoke on the podium behind Hühnlein's back, making the spectators laugh. He has been mentioned as "young, good-looking, dashing and carefree". The German motor racing public really took Rosemeyer to their hearts, possibly making him, regardless of the German reborn interest in motor racing during the last decade, Germany's most popular racing driver ever. It's typical of Rosemeyer that he seemed to have no idea of what salary a driver of his class should have. Only in late 1937, after starting a family, he seems to have woken up, asked around (Stuck later got in trouble because of that) and demanded a huge increment to his salary for the 1938 season. There were two events when Rosemeyer's heart wasn't for driving. The first was the 1936 Coppa Ciano when Elly at the same time was flying. Bernd gave up early and handed over his car to Stuck. It is clear that racing the Auto Union the way Rosemeyer did it not only needed total enthusiasm but total concentration as well. Without it racing would be dangerous and obviously Rosemeyer was aware of it. The other time was during Rosemeyer's last record attempt, in January 1938. This was no GP race. In this case he could not drive a few laps and then retire. Too many eyes were upon him. Too many were expecting the impossible from him. So the whole event had the feeling of "let's get it over so we can go home". Rosemeyer's rebel nature hardly made him suitable for the role of ideal aryan Himmler was trying to make him into. Attempting to make Rosemeyer a Nazi regardless of his SS-Hauptsturmführer title was and is hopeless. Like Herman Melville's "Billy Budd" he will instead come out with an aura of the complete innocent, who at the end cannot avoid the fate that the evil times bring upon him. For generations of racing fans the qualities Rosemeyer did have are sufficient to make him something special. For them he remains an ideal of what a racing driver should be like. Bernd Rosemeyer's GP career lasted only 979 days, but 65 years after his death he still has a special place in the hearts of the real Grand Prix enthusiasts.